Photograph of campus grounds during the construction of Fraser Hall; aerial view. Photograph of campus during the construction of Fraser Hall; aerial view. Photograph of campus grounds taken after the completion of Mattson Centre; aerial photograph. 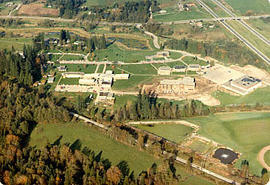 Photograph of campus grounds taken during the construction of Mattson Centre; aerial view. Photograph of campus grounds taken during the construction of Fraser Hall; aerial photograph. 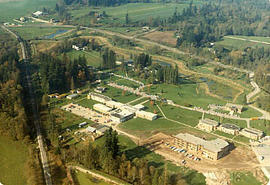 Photograph of campus grounds taken after the completing of the Robert N. Thompson Building; aerial view. Photograph of campus grounds taken during the construction of Fraser Hall; aerial view.